Sophie is starting a new school year. Shopping for it with her best friend should be fun, but nothing seems to fit, which is a major issue to a high school girl. But her biggest problem is the secret she's keeping. And she's about to find out that she won't be able to keep things under wraps for much longer. 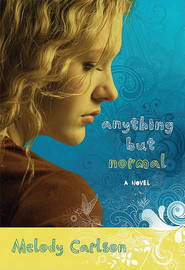 This page-turning novel explores the tangled web of choices, secrets, and love that all teen girls navigate. Melody Carlson enjoys a huge audience of teen readers. Now, Revell presents another new stunning story from an author who understands teen girls right where they are. Melody Carlson is the award-winning author of more than 200 books, including Revell's teen novel Just Another Girl. She recently was nominated for a Romantic Times Career Achievement Award in the inspirational market for her many books, including the Diary of a Teenage Girl series, Notes from a Spinning Planet series, and Finding Alice, which is currently in production as a Lifetime Television movie. Melody and her husband live in Sisters, Oregon.